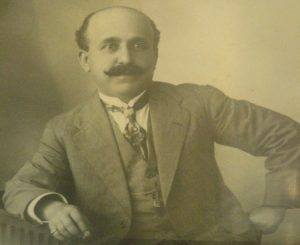 Charles Abraham Farah first came to Australia from Lebanon in the late 1800s acting as agent for his uncle, a merchant based in Marseilles, France and Damascus, Syria. On one of his journeys he brought his wife, Anne Moutron, with him and they set up a general store at Braidwood. While at Braidwood, three children were born: William in 1902, Marie in 1904 and Felix in 1907. Their fourth child, Olga, was born in 1910 in Baalbek, in Lebanon, Charles Abraham’s home village. 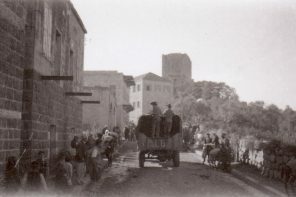 In 1909, the family set out on a prolonged visit to Lebanon, leasing its business to a fellow countryman, Mr Taffa. Caught up in World War One, the family became political prisoners of the Turks in 1916. They suffered severe deprivations and were lucky to survive. 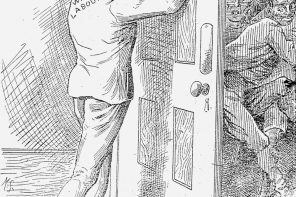 After their release, the children resumed their education in Lebanon while Charles returned to Braidwood, Australia. He sold his shop and came to Forbes where bought a property in Templar Street. The two girls married, and the family moved to 3 Wombat Street. Since Anne had died in 1929, Charles, Bill and Felix lived there together until Bill married Mary Lowe of Carcoar in 1938 and moved to Underwood Street, Forbes. In 1940, Felix married Florence Acheson who was a member of the family’s business staff, and they lived all their married life in the Wombat Street house. Charles Farah died in 1942. Charles spoke little English but had a good head for business. He opened for business with a grocery store on one side of his small premises and a drapery on the other. In 1923, Anne and their children joined Charles in Forbes and they lived in a house in Farrand Street, Forbes. In about 1926, Charles purchased a butcher’s shop on the western side of his premises. He expanded again in 1928 by purchasing the Blue Bird Cafe on the other side of his store. Next he added a bicycle shop and Rene and Freda Heinke’s dress shop in the 1950s. He renovated the combined premises including the butchers shop including tiling of the whole floor area in black and white. In about 1950, it was decided to create a general store including a supermarket, kitchenware, hardware, menswear, and sportswear. A liquor license was also acquired. Farah’s was a household name for many years in Forbes. The firm stood by many people during hard times extending credit until circumstances improved. Farah’s store was a meeting place for families and friends visiting town for the weekly (as it was) shopping. Out-of-town school children found a safe place to leave school gear and meet up with their families for a ride home. Floss Farah worked continuously beside her husband Felix and their son Greg who managed the grocery department. Bill’s sons, Michael, Paul and John, also worked in the store. After Bills retirement in I960 the store was managed by Felix, Floss, Greg and John until the store closed its doors for the last time on 13 March 1990. John Farah continued in business in Forbes running his own television antenna installation and television repair business. Bernadi, Helen. 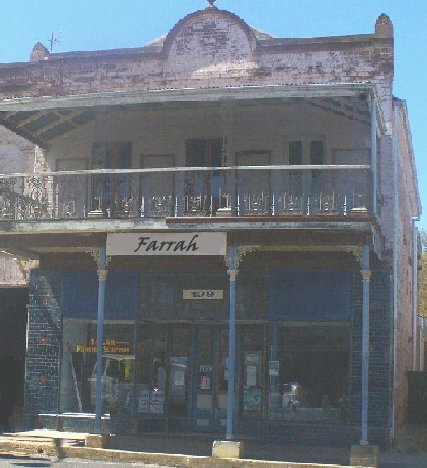 ‘Contributions by business houses: Farah’s’ in The history of Forbes NSW Australia, Forbes, NSW : Forbes Shire Council, 1997, pp. 337-8.